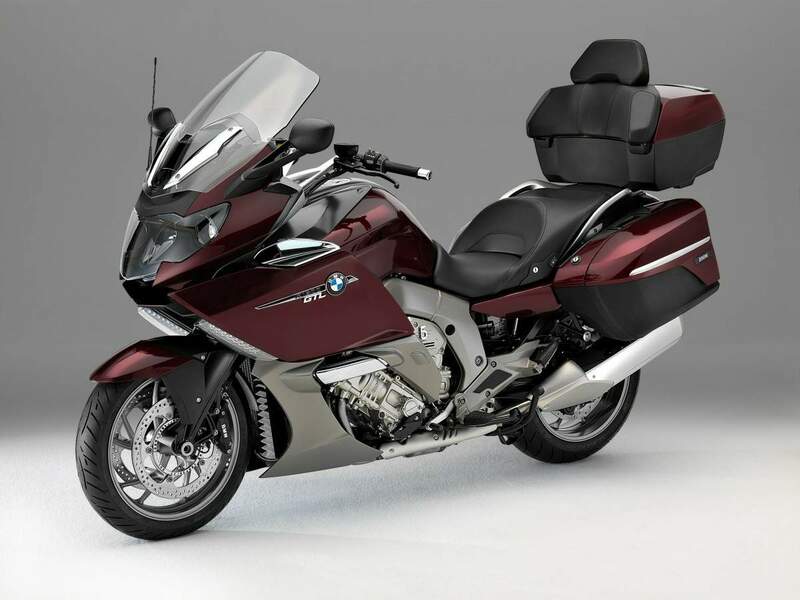 The K1600GT and K1600GTL luxury touring bikes. The 2013 K1600GT is now available with new metallic paintjobs – dark graphite and blue – and LED headlamps will be available as an option from October this year. 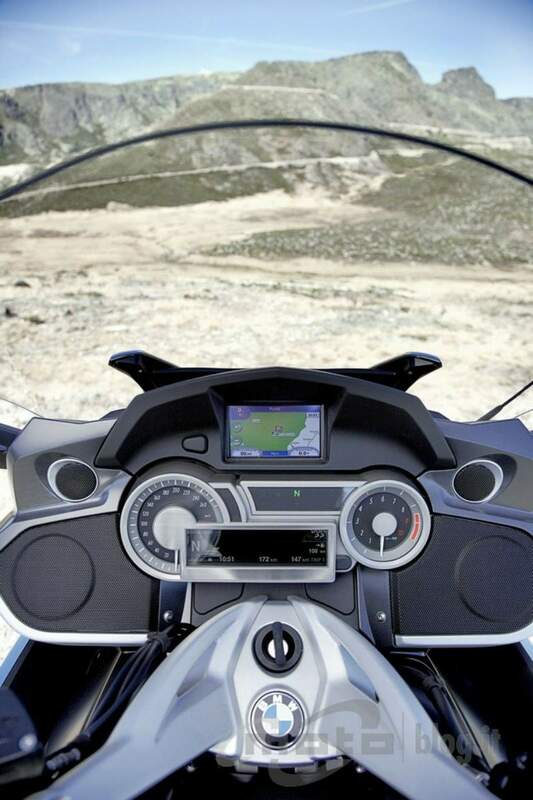 And the bike’s 5.7-inch TFT colour screen on the instrument panel now has an optional digital speed display. 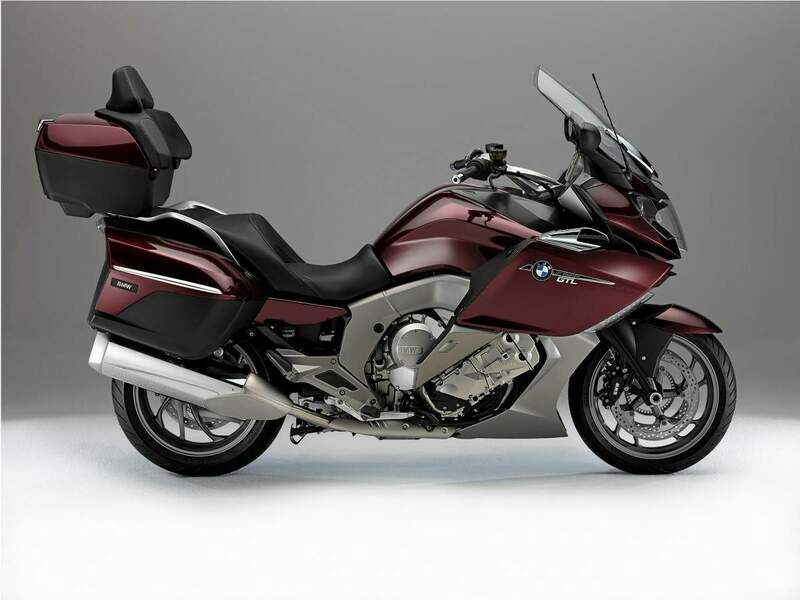 The 2013 BMW K1600GTL also gets new metallic paint finishes – dark graphite and red. Both the K1600GT and K1600GTL remain mechanically unchanged for 2013. Both bikes are fitted with the same 1600cc inline-six engine that produces 160 horsepower and 175Nm of torque. The GT weighs 319kg, while the GTL weighs 348kg, and both bikes are fitted with an adjustable traction control system that has rain, road and dynamic riding modes. The bikes’ light alloy bridge-type frame, Duolever (front) and Paralever (rear) suspension, electronically adjustable suspension (ESA II), anti-lock brakes (ABS), adaptive headlights that compensate for pitch and banking, superb ergonomics and vast range of optional accessories make the K1600GT and K1600GTL two of the best touring bikes in the world. BMW is aiming to make the broadest sweep possible across the big tourer classes with its new six-cylinder engine. 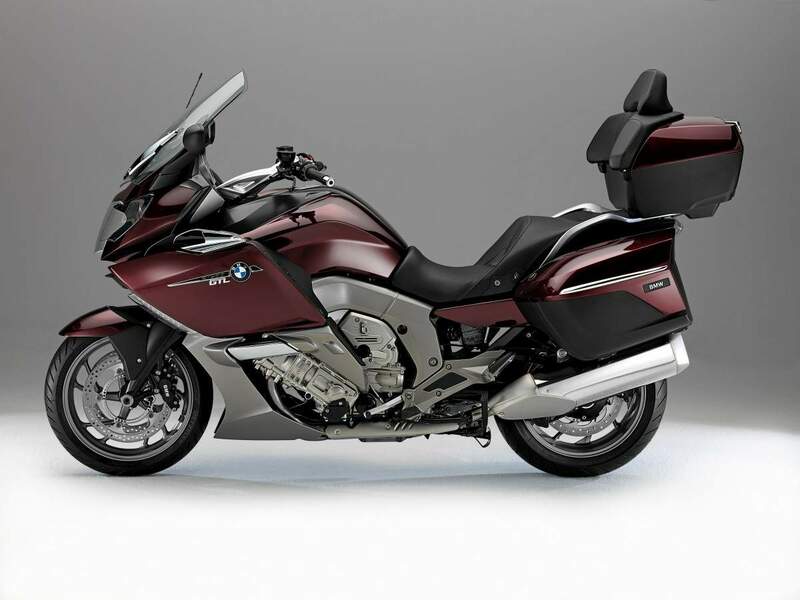 The K1600GT is designed to cover the same ground as Kawasaki’s 1400GTR, the Yamaha FJR1300A and Honda STX1300 Pan European – even to the point that BMW has deleted its own direct rival to this competition, the K1300GT. The K1600GTL meanwhile replaces some of the GT’s sportier genes with luxury ones, to the point where even though both machines share the same chassis and power train from engine to rear wheel, the GTL has a distinctive character and finds itself up against a different set of bikes. I wasn’t alone in this, Motor Cycle News editor Marc Potter had exactly the same feeling, and both of us quizzed the German design team afterwards about any unmentioned differences, but there were none. It simply appears to be a case of how you ride the bike compared with the GT. Even so, the GTL is no tyre shredding torque monster either. It pulls reasonably well at low rpm, and as with the GT you can trickle it down to engine idle speeds in the high gears and there’s no hint of discomfort from the transmission, just an obedient wafting along in the traffic which makes slow speeds as much fun as high ones. But there’s still some disappointment that you don’t get more from the motor in the lower levels, and as with the GT you do need to trouble the slick-shifting gearbox more often than you’d hope in order to get past slower traffic. I've produced a feature comparing the lower rev torque at the rear wheel, where it really counts, and it shows the K1600GTL has a lower torque/kg ratio than the discontinued K1300GT for a substantial section of the lower rev range. It also builds more slowly. The suspension definitely is different though, being significantly softer on the K1600GTL, but it isn’t any more comfortable for that as it feels underdamped and crashes over bigger bumps and potholes, to the point where the rider can be jarred through the seat. I spent a lot of time switching between the ESA mode settings, not just to try them out but because I could never find something I was entirely happy with, swopping between the harshness of Sport and the jarring of Normal. Comfort was just too soft. It was an irritation more than real nuisance after I’d got used to it, and riders coming from Harleys or Gold Wings will wonder what I’m complaining about as the GTL is better than either. But the GT is superior again and in Normal offers a convincing and comfortable ride, where the GTL often jiggles or bumps. The GTL’s stability is less impressive too, although you do need to be pushing things to discover this. At 100mph (160kph) it can start to feel a little vague, and by 120mph (190kph) it can become unnerving. I didn’t get a chance to max it out, but one rider who did said it was getting borderline scary when a corner entered the fray. I shouldn’t worry about this too much though, at anything below 100mph the stability is fine, and higher speeds are mostly done on long straight roads anyway where there are no problems either. Maintaining a rapid pace is delightfully easy as the huge screen fends off the windblast with accomplished ease, so you sit upright commanding your cruise ship with its array of information displayed in LCD monochrome and TFT display (feature here), serene as the world rushes backWards around you. Personally I prefer the GT’s more forward leaning position, but I can imagine some riders will prefer the GTL’s sofa-like stance when there are really serious miles to cover. American riders tend to prefer to look through a bike’s screen where Europeans and others like to peer over the top edge (we get rained on more...), and the K1600GTL caters for both with the extensive range of screen movement. Do note though that at higher speeds, when you raise the screen to its maximum to look through it, the force of the air pressure pushing you forwards is uncomfortably large. The passenger’s wind protection is equally impressive. I’m not a typical pillion at 6’3” (1.91m) and my head was out in the slipstream to an extent, but even that was better than many bikes. When I ducked my head to more physically normal levels it dipped into a region of calm and quiet I’ve not really experienced on the back of a bike before. This does change as the screen is adjusted of course, but the potential is there certainly for a very pleasingly quiet and turbulence-free ride on the back. The seat itself is very wide and extremely comfortable, although this is achieved by extending it over the top of the grab handles. Fine when the topbox with its back rest is fitted and the rider is accelerating, but the K1600GTL has a fearsome braking capacity and when you’re slowing down it’s difficult to hold onto the handles. You can hook your hands under them but it’s not possible to grasp them properly as the seat padding gets in the way, and there aren’t many other places that are easy to hold onto. The GT with its narrower seat and clear handles is better. The topbox anyway detaches very easily, and it’s satisfying to use as the lid glides up on a gas strut when you undo the catch – a neat touch that’s entirely in keeping with the rest of the bike’s sophistication, as is the optional central locking, which when you have a total of five compartment locks (the box, both panniers and the small cubby holes in the lower fairing) is genuinely useful rather than mere gimmick. As with the GT the impressive airflow management extends to removing the engine’s heat – it escapes the bike while avoiding both rider and passenger, so you don’t get painfully hot sitting in traffic for long periods, and like the GT the GTL is very well balanced once you’re moving at little more than walking pace and sits solid and reassuring at low speeds, until you have to execute a tight U-turn, when the weight starts to let you know it’s there. Not as much weight as a Gold Wing though, which is 792lb (359kg) dry and with far fewer gadgets – not even an electric screen, let alone onboard adjustable suspension. That would easily be 860lb (390kg) in a comparable condition to the BMW’s wet weight, and you’d really feel it. I’d love to comment more on the Gold Wing differences, in particular the low rev pull and how it compares, but it’s been a long time since I rode one – it’s not changed either in a decade. I do suspect though the Honda has more initial thrust, as its torque peak is a lot lower than the BMW’s, 4,000rpm compared with 5,250rpm, and it’s only 6lb.ft (8.1Nm, 0.83kgm) less. The 1832cc, six-cylinder Wing has a much lower maximum power at 117bhp (119PS, 87.3kW) which also points to greater low rev torque, and reading my old reviews I did comment on the ‘irresistible twist’ from idle upwards, which I wouldn’t accuse the K1600GTL of. The Wing I do remember has a sharper clutch and sudden throttle action though which mean lower speeds can demand more concentration. But it’s the differences between GTL and GT which many will be wondering about, and here my rides were only a day apart. The GT undoubtedly is the sharper handling, but it also has a better ride quality, and some passengers will prefer it for the better access to the grab handles. Those with larger bottoms will go for the GTL’s though and make do with the rider’s grab handles instead. High speed stability is superior on the GT but the wind protection not as comprehensive as the GTL’s, and the riding positions are quite different, the GTL being lower set and more upright. Note that BMW quotes 3.5 per cent worse economy figures but a 10 per cent larger fuel tank, so the range should be slightly more. After that it’s down to spec and price – I can only offer the UK versions here, but the specs are significantly higher, as you’d expect of BMW’s top level touring bike.